Other than wood, I’ve been cutting other materials with a hacksaw for quite some time. Never minded the labor, but it just takes a long time to cut a 2” round steel bar :/ so I’ve always kept my eye open for a small bandsaw deal. After missing out on a few on CL, and noticing HF opened a store not far, with a grand opening, and tax free weekend I figured It’s probably as good as it gets for a new saw so I went and got one. It seems several mfg are selling what seems to be the same saw (HF,grizzly,grainger, jet, and probably a few more in different colors) and most are in the 400-500 range while HF is in the 200 range (and can be had sub 200 as well). I checked all the specs, and manuals, and made sure these are all the same saw, and decided to go with HF because it is literally less than half price of the alternatives. The saw is a horizontal/vertical saw with a 4×6 capacity. not quite a resaw type, but for cross cutting long stock to size it is THE right-tool. 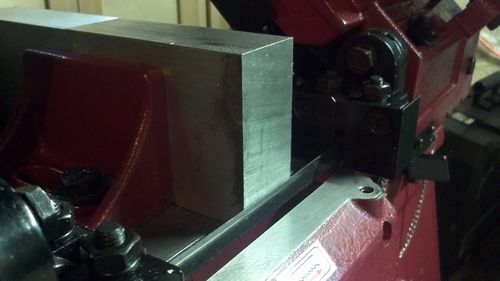 it has a stop block that can set a preset length of cross cut for short/medium lengths and you can then run your stock through it for a batch cut of parts. the saw will lower itself over the part and will automatically cut through the material (wood/plastics/metal) in the horizontal mode so you can do other things in the mean time. In the Vertical mode it has a smallish table that can be mounted and used similar to any other woodworking bandsaw minus the fences, mostly for free (curve) cuts. Why pay more for other mfg you ask? because HF Quality Control seems non existent, so you are gambling whether you will get a good unit or not. To be fair, you might get a lemon from other mfg as well, but the probability seems lower. I got my (first) saw and brought it home. its quite heavy, and requires 2 people to assemble as you need to build the base for it, and have a 2nd person help you lift the actual saw and mount it on the base. you can probably figure out how to do it solo (which I did) but a helper really simplifies the process. I was a bit bummed for a new product to looks like this, and contacted HF support. to this I must say support was very helpful and communication was GOOD. 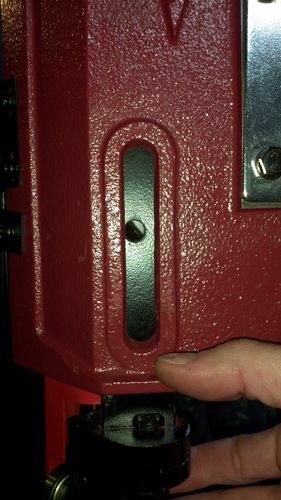 I got replies to both my email, and phone call saying that the part is no longer stocked, and that I’d have to replace the entire saw. good communication, but not a very good outcome (for me). build the base (again), mounted the saw on the base (again), cleaned it up (again), and this time all seemed a bit better albeit , this saw seems a bit less stable for some reason – I guess each with it’s own issues. the cut above took about 2 minutes as far as I can remember, something that would otherwise could take me 15-20 min with a hacksaw, so definitely an improvement. I did get a few bimetal blades (not from HF) for it, but will wait until the stock blade fails before swapping anything. There are other known issues with this saw, but will address them as they appear (if they do), for now this one seems to work well. I see some people refer to this saw as a “kit” and I guess that’s a good way to look at it. you are basically buying a project kit and plan to “make the saw yourself” with the parts in the box. I did buy it knowing that I would have to sacrifice time and effort to make it work or I would have been very disappointed otherwise. 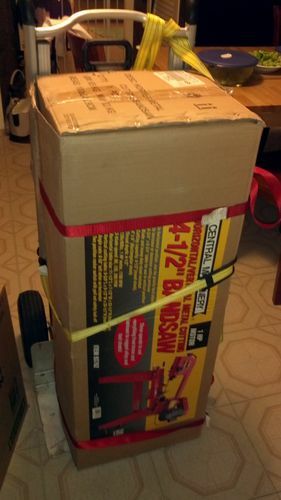 I would not recommend this saw for any business that relies on this for income, if you need a saw to generate day-in-day-out work, get a better quality machine, but if you are a hobbyist and need a saw for minimal expenses – this is a good alternative. just understand that you may need to put more effort into making this work as other options out there. All in all, I’m happy with the cutting capabilities I now have, but this is for hobby use so I do not expect much of it, and I am also capable of fixing it if anything goes wrong. may not be everyones flavor. Some factory in China is definitely pumping out these saws for all the name brand vendors. 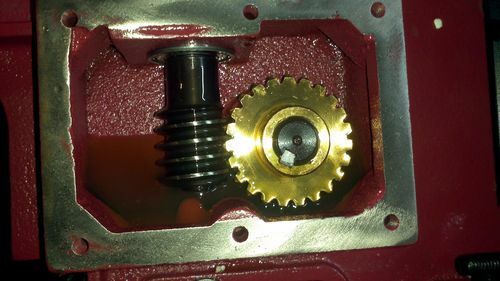 Over the years there have been some changes (worm gear box being separate or part of the casting, guide wheel arm mounting method). The various manufacturers do get some tweaks & the HF one has the weakest motor of the lot (an ancient Jet one with a 1/2hp motor I had was much more power than the 3/4hp HF one). My original Jet did pretty well considering I got it from an estate sale in need of rewiring & with no legs. It ended up getting knocked over & breaking. I swapped the motor onto the used HF replacement one I got (it was way underpowered & in need of some TLC). I probably paid $150 for the both of em. The 4×6 bandsaws are very generic & popular, lots of sites out there dedicated to tweaking them for better performance. Thanks for the review, Purp. I’ve been looking around for a metal lathe. HF has a Central Machinery one for less than $800 on sale right now. I’ve also looked at the Grizzlys. I’m just going to play around, so I just can’t pull the trigger. Maybe I’ll take the gamble, like you did. Nice review Sharon. I have a reciprocating hack saw that I’ve had for years. it works well. I’ve seen large chop saws for metal with bayflex wheels in them. I’ll bet those work well. I might have one some day. For cuts that don’t require a lot of precision a hand grinder is a nice tool too. I do a lot of welding and cut a fair amount of metal at times. have you put a chunk of metal in, say like a piece of angle iron? I bought a Sears metal bandsaw about 30 years ago and I’ve put it to great use. (I hate a hand hacksaw). Looks like a great buy. Mine sits for over a year without use, even more so, now that I’m not suppose to use the electric welder. I have this saw for about 2 years ( I paid $169.00 for it, I believe). I did review on it. I do not use very often but when I do I am very happy with it. I am going to use quite a bit to cut 3/4” black pine this weekend to install a new gas line in the kitchen. The one thing I do not like with this saw is how top heavy it is, even just moving it, it is dangerous as it tips over extremely easily. Hard to beat $299 with a 25% off coupon. Once I clear some more shop space, one of these is on my todo list.. I bought the same one. Had major problems with it’s ability to shut off, and cut just past it’s table top. In the vertical position, forget it. Also, I had to cut off the corners of the clamp when making 45 degree cuts. 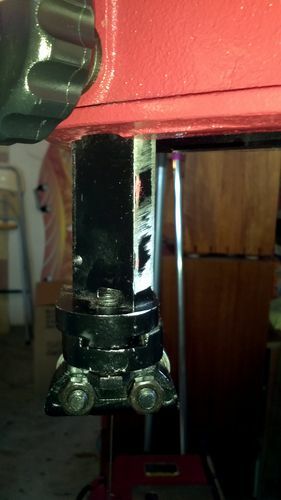 I broke blades for a while until it worked it’s self in. Over all it is a piece of junk, but if you keep messing with it, it will start working good enough. I would not say it’s a piece of junk… that’s a bit harsh. but there are definitely units with issues with them. if you get one “good” one, it’s mostly a good saw for the home shop. especially considering it’s sub 200 price range. if you get a ‘bad’ one- at least HF is good to take it back/replacement which is what I would recommend doing (and done so myself). for a production shop – yeah – get a bigger/better quality machine. It’s a great bang for the buck – but like said – will require payment in the form of time/effort. Bertha… The 7x & 9x lathes are the exact same deal, all come out of the same factory. Check out that link to http://www.mini-lathe.com, all the info you need is there. HF probably has a weaker motor & fewer accessories, but the chassis is going to be the same. Interesting review, Sharon. HF is hit or miss but the hits are pretty good. I think anything from there requires some tinkering. Sounds like another HF “labor vs. price” deal. If you have the time, it’s a great deal. If you need to assemble and go, buy something else. If you go for the 7x, get something a bit longer. I am waiting on my new bed to come in. 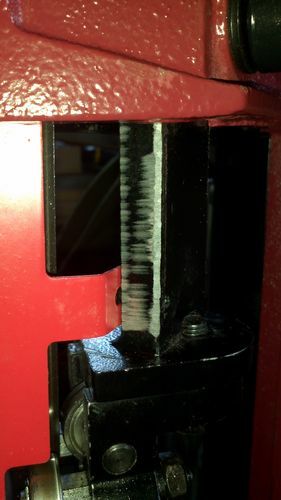 The 7×10 gets awfully cramped when using drill bits in the tailstock. I went for the 14in bed. I have a 7×16 micromark at work. It is a really nice little lathe. If it is in the budget, this is probably best of breed. I really like that one but I cheaped out (on space) and got the portable bandsaw. Someday soon will be the project to make a stand for it. It is awfully hard to go wrong when they are only $80 minus whatever you come up with for coupons.